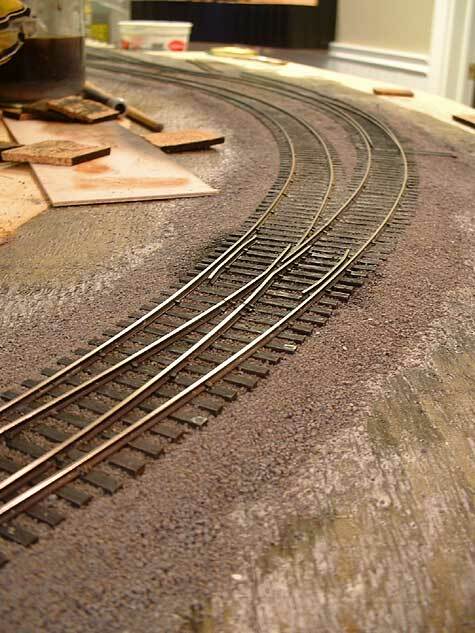 This week I painted the trackwork for the dock yard and got ready for some ballasting. 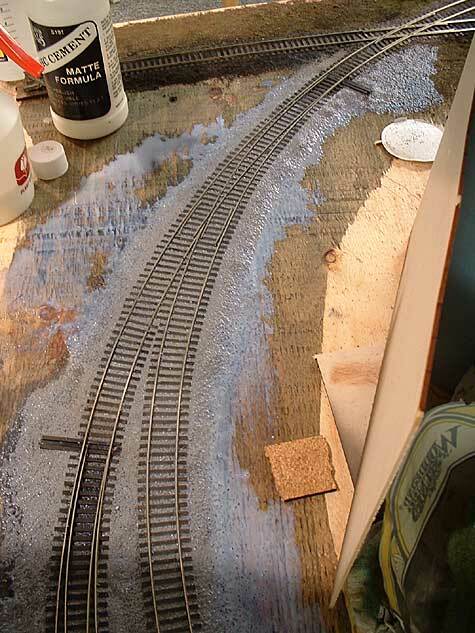 I gave all the track and the plywood roadbed a quick wash of stain first, so painting is easier. Once dry, everything was painted with a blast of Floquil Rail Brown. I used some Railroad Tie Brown on the rails, (I know, a bit backwards) and then drybrushed the ties with a light grey. 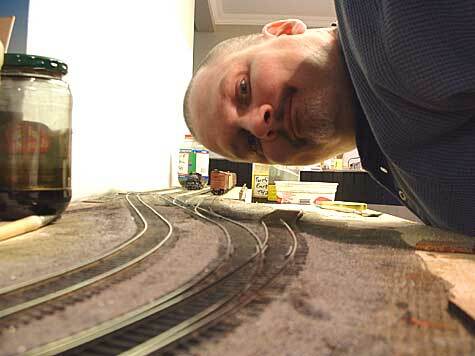 And forgot to take any pictures, so you will just have to imagine an image of someone painting trackwork with an airbrush. 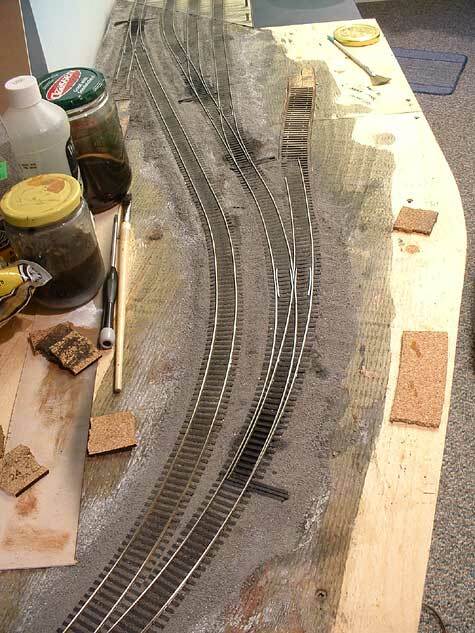 Once dry, I cleaned off the top of the rails using a 2″ square of cork roadbed soaked in lacquer thinners, and followed up immediately with a dry piece of cork. Works great! Since the cork is flat it only cleans off the top of the rail, and it is absorbent enough to soak up a bit of thinners. Again, no pictures. 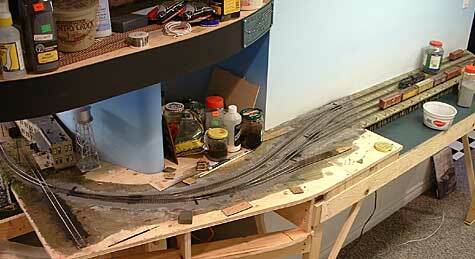 Last night I got ambitious and ballasted all the trackwork. Click on picture for larger view…. 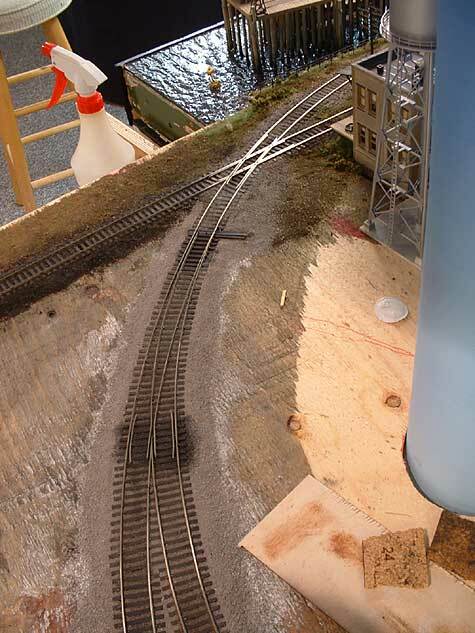 I used Woodland Scenics fine ballast for the majority of it, with some fine dark ballast for the siding. A bit of sifted playground ground sand was also used to create a bit of texture. 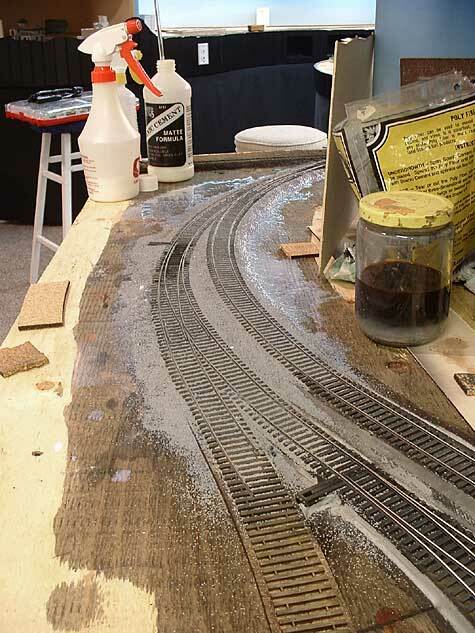 Everything was glued in place with Woodland Scenics scenic cement. I love this stuff! I used to mix up a batch of diluted white glue with water and soap, but found the results hit and miss, and a little bubbly too. Using the pre-made stuff speeds things up nicely. I use a spray bottle with some isopropyl alcohol in it and give everything a good soaking first, this really helps to glue to flow into all the ballast, which is critical. I then spray on a liberal amount of the glue, with a spray bottle. I finish up by applying even more glue using a glass tube, the kind found in a lab (or in my case a surplus store). This tube holds lots of glue, you just put your finger over one end to hold it in the tube, slowly removing the finger will allow the glue to flow quickly out. A soupy mess. Dries up nicely though, the glue is completely invisible, in fact it is hard to tell anything is actually solidly adhered in place, once dry. 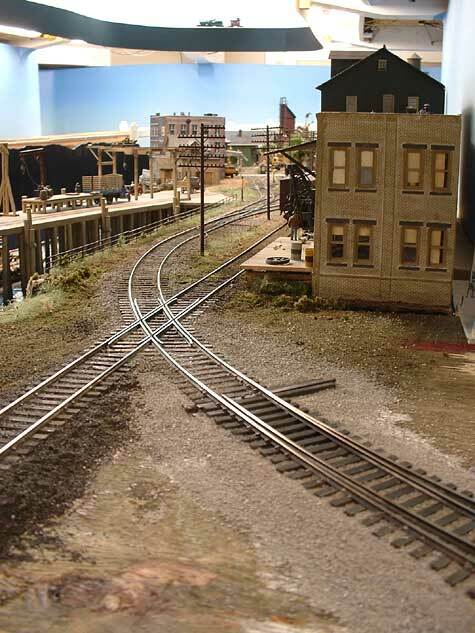 Next I think I will bet back to work on the apron for the car ferries, then I will finish up the scenery around the yard. 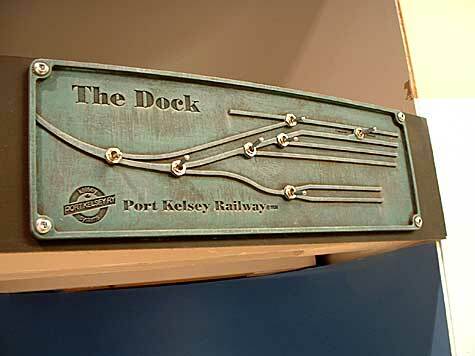 Ferry dock control panel added! 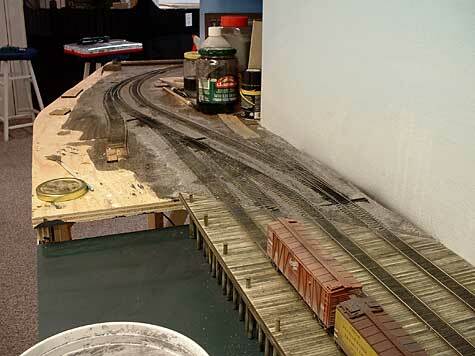 Working at a snails pace, I managed to get the trackwork completed on the dock addition. The other night we installed the switch machines and cut the gaps. (We because Ron has been recruited). I did not want to get too fancy in the installation of the switches for the dock, as it looks like I may be moving soon and will have to dismantle the layout. I do want to get this section operational though as I think it will still be six months or so before the dreaded dismantling. With the Alberta sightseeing out of the way, we hit the road to Ontario. I had been warned that the drive would be nothing more than 4 days of mind numbing monotony. It turned out to be 6 days. But little of it was mind numbing, on the contrary, I found it very interesting. 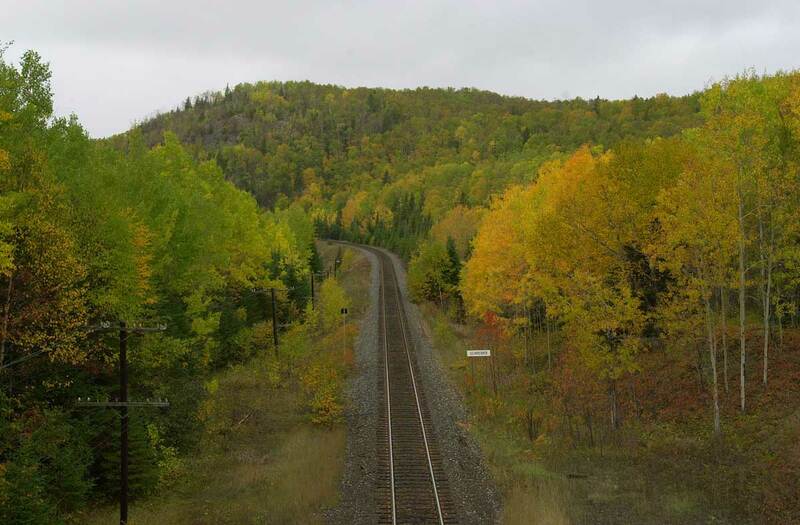 The fact that we timed it with the height of the Autumn colors might have had something to do with it…. Train tracks somewhere between Thunder Bay and Sault Ste. Marie, Ontario.